1 In a large pot, boil the potatoes until tender. Add the carrots and cook for 10 minutes more. 2 Transfer the mixture to the pan. Add the snow peas, peas, wax beans, and corn. 3 Mix the flour into the milk to form a smooth paste. Stir into the vegetable mixture. 4 Bake for 20–30 minutes, until all the vegetables are tender. Stir regularly to ensure that the flour/milk mixture is smooth and does not form lumps. Add the salt, pepper, and margarine. 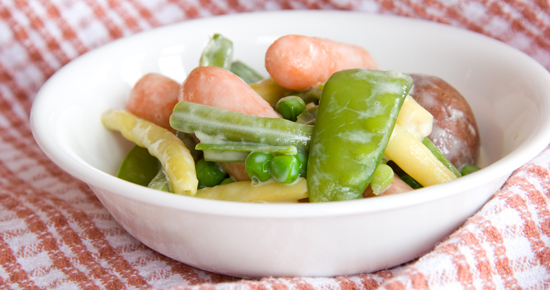 Tip: In Nova Scotia Hodge Podge has traditionally been served as a main dish, but it can be served as a side dish to any protein choice. • belong to the vegetable family known as legumes, whose plants produce pods with enclosed seeds. • have special nodules on their roots that enable them to take nitrogen from the air and fix it in the soil. So peas actually improve the soil they grow in. • are a good source of vitamins A and C, thiamine, folate, iron, and phosphorus. In addition, they are rich in protein, carbohydrates, and fibre, and are low in fat. • that are frozen retain their colour, flavour, and nutrients better than canned peas and are lower in sodium. They are in ready supply year-round. • can be cooked by using a small amount of water. The less liquid that is used, the less vitamin C that is lost.